MOORESVILLE, N.C., May 30, 2018 /PRNewswire/ — Lowe’s Companies, Inc. (NYSE: LOW) today announced the release of its 2017 corporate responsibility report. Titled “Framing Our Future,” the report outlines new corporate responsibility goals and highlights the company’s progress in three strategic areas: product sustainability, community and people, and operational excellence. The 2017 Corporate Responsibility report can be viewed on Lowe’s newsroom. The company also launched today a new, digital corporate responsibility platform within Lowe’s newsroom. From environmental stewardship programs to community revitalization efforts, the site offers year-round sustainability updates and showcases stories that demonstrate Lowe’s purpose – to help people love where they live. Lowe’s and Lowe’s Foundation will invest $350 million in local communities through partnerships and charitable contributions. Lowe’s employees will contribute more than 3 million volunteer hours to improve the communities where they live, work and play. Lowe’s will ensure 100 percent of strategic suppliers have sustainability goals. Lowe’s will increase the number of eco-friendly products available to customers, helping them save more than $40 billion in energy costs through sale of ENERGY STAR products. One-hundred percent of wood products will be responsibly sourced. 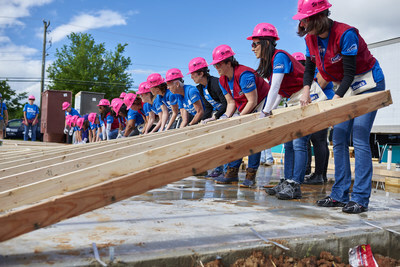 Lowe’s and Lowe’s Foundation gave more than $39 million in charitable contributions, and every U.S. store completed at least one Lowe’s Heroes volunteer project to improve their local community. Lowe’s committed to remove the chemicals methylene chloride and NMP from all paint removal products globally by the end of 2018. The Lowe’s Employee Relief Fund distributed $3.2 million to help employees impacted by financial hardships, including those in the path of Hurricanes Harvey and Irma. 2020 Women on Boards recognized Lowe’s for championing gender diversity and having 20 percent or more board seats held by women. Lowe’s sold enough Water Sense products in 2017 to save customers 6.6. billion gallons of water and $69 million in utility costs over the products’ lifetime. 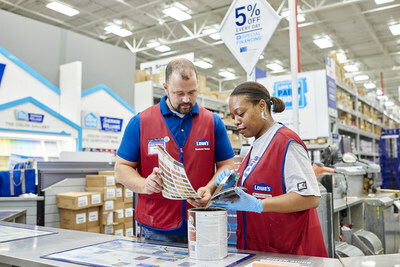 Lowe’s invested 2.1 million hours of training time for front-line leaders. To download the report or to learn more about corporate responsibility at Lowe’s, please visit newsroom.lowes.com/responsibility.